The Constitution’s Tenth Amendment notes that any power not given to the federal government is reserved to the states or the people. The Constitution does not give the federal government power over the disposition of property upon someone’s death. This is a power reserved to the states, and the law in this area varies from state to state. While Illinois gives a person much freedom to dispose of his property (known as his “estate”) at his death, this freedom is gained only through the execution of a valid Will. To be valid a Will must meet defined formalities. 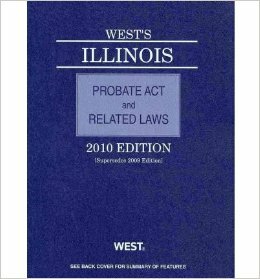 Will execution formalities and the consequences of not having a valid Will are found in the Illinois Probate Act. Article IV of the Act specifically defines the formalities of a valid Illinois Will. An Illinois resident who dies without a valid Will dies “intestate”. In that case, a person’s estate will be distributed by the probate court as directed by law. The Illinois law giving direction to the probate court to distribute the property of someone who dies without a valid Will is in ARTICLE II, DESCENT AND DISTRIBUTION of the Illinois Probate Act. When someone dies intestate with a surviving spouse and no descendant, the surviving spouse receives the entire estate. If there is a surviving spouse and there are descendants, one half of the estate goes to the surviving spouse and one half is divided among the descendants. After that scenario the Article II, Descent and Distribution defines many other possibilities. If someone wants to be certain that the entire estate goes to his/her spouse, he/she needs to have a valid Will. The possible halving of the spouse’s estate share is the most glaring example of how property distributed according to the Illinois Probate Act may differ from someone’s wishes. As the scenarios get more complex, the chances that one’s property will be distributed in a way that someone who died without a Will would have wished becomes more unlikely. The possible variations in property distribution demonstrate the importance of having a valid Will. Property distribution is not the only important consideration in executing a valid Will. One Pleasant and Ten Practical Reasons to Have a Last Will and Testament explains additional considerations. Among the most important for parents with minor children is how a Will can be used to appoint a guardian. Beyond having a Will, there are also steps one can take in how to own property or the use of a “living trust” that not only determine property distribution, but direct how property is to be used after death. Illinois law specifically excludes two types of Wills. Holographic Wills. A holographic Will is one that is handwritten by the Testator without any witnesses. A Will created in that fashion will not be recognized in Illinois, unless it meets the witness requirements of Illinois law, or was made in another state that does not require witness signatures. Nuncupative Wills. A nuncupative Will is one that is made verbally in the presence of witnesses. Such a Will is made by terminally ill individuals when a written Will is not possible. Some jurisdictions recognize nuncupative Wills in some situations, Illinois does not. Illinois requires the Will to be in writing. If a Will is handwritten by the Testator includes the required Illinois formalities, it is not considered holographic under Illinois law and is valid. The testator’s signature must be on the Will. This signature must be at the end of the document. The law provides an alternative to the testator’s signature in the event of a physical incapacity. The Will may be signed by someone else on behalf of the testator. In that event, the testator’s name must be subscribed at the end of the Will by some other person in the testator’s presence and by the testator’s direction. This individual may not be one of the two witnesses otherwise required. The signatures of two attesting witnesses are mandatory. Any person competent to be a witness may witness a Will. The witnesses must sign in the presence of the testator as well as the presence of each other. Witnesses who have in an interest in the Will, that is beneficiaries, may sign, but Illinois requires at least two witnesses that are not beneficiaries. Since Illinois requires witnesses beyond beneficiaries it is often better for individuals with no interest in the Will to witness so that there will not be any claim that a witness exerted improper influence over the Testator. An affidavit is not required for an Illinois Will to be valid. There are certain probate advantages if an affidavit of the Will’s authenticity is signed by the testator and the two witnesses before a notary the Will is “self-proven”. Such a “self-proven” Will may be probated in a simplified procedure. Many jurisdictions have requirements differing from those of Illinois. Wills executed in those jurisdictions according to their law will be recognized as valid in Illinois. The exceptions to this rule are the “holographic” and “nuncupative” Wills discussed above. There are times that someone may wish to make a minor change to a Will without rewriting the entire document. Such changes, clarifications or amendments are referred to as “codicils”. Illinois will recognize such changes to a Will, but only if a codicil meets the formalities required for the original Will’s execution. Which certainly brings up the question of Congress’ power to impose an estate tax. Though the courts have typically upheld this power, thoughtful people have made strong arguments that no such power exists.